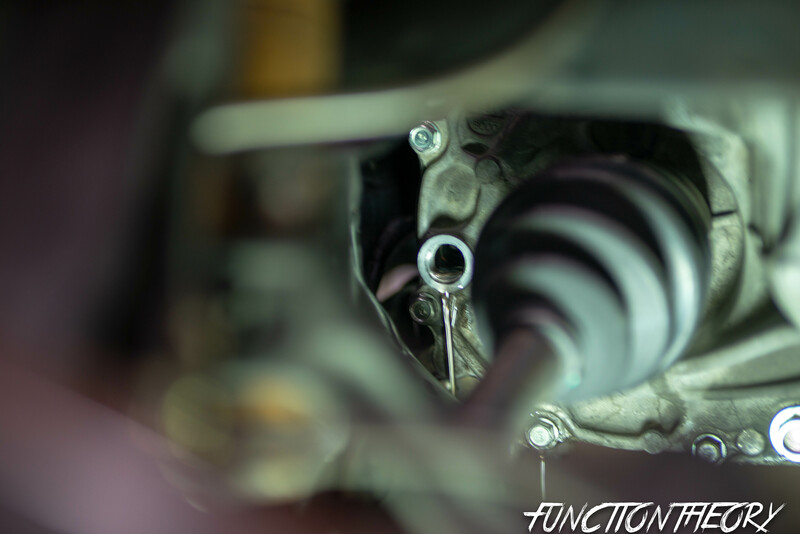 Manual trans fluid change. This is probably one of the most overlooked fluid changes out there, I mean really how often do you ever, or hear of people changing it. Even by Honda’s official standards you have already done the coolant twice and the brake fluid once before they “recommend” you change the trans fluid at the 90k service. 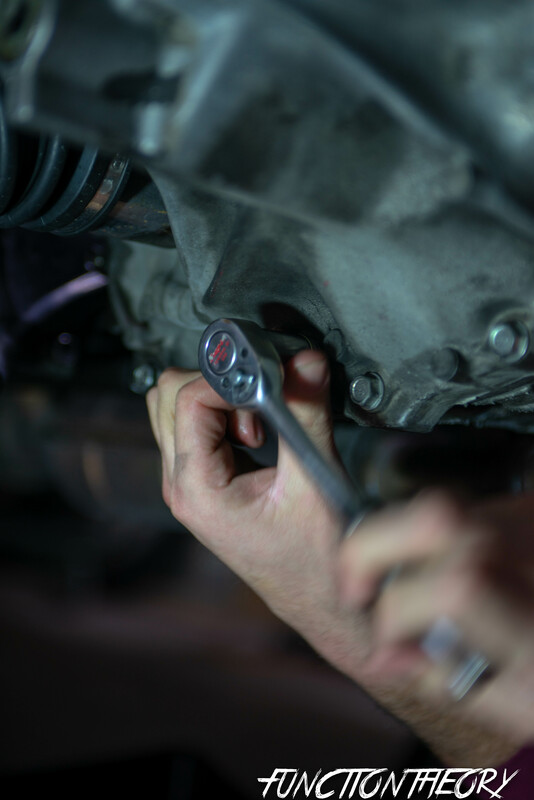 By that time even the worst of car owners have done 9 oil changes, the average owner will have done 18, the good car owner would have done it 30 times, and I would have done it 90 times. Just think about these figures. How crazy it is that you would do that many oil changes before you did even ONE trans fluid change. It’s also crazy to think that if you do the trans fluid change yourself its cheaper than doing an oil change. Now really think about how much you use the transmission… 1st, 2nd, 3rd, 4th, red light, neutral. 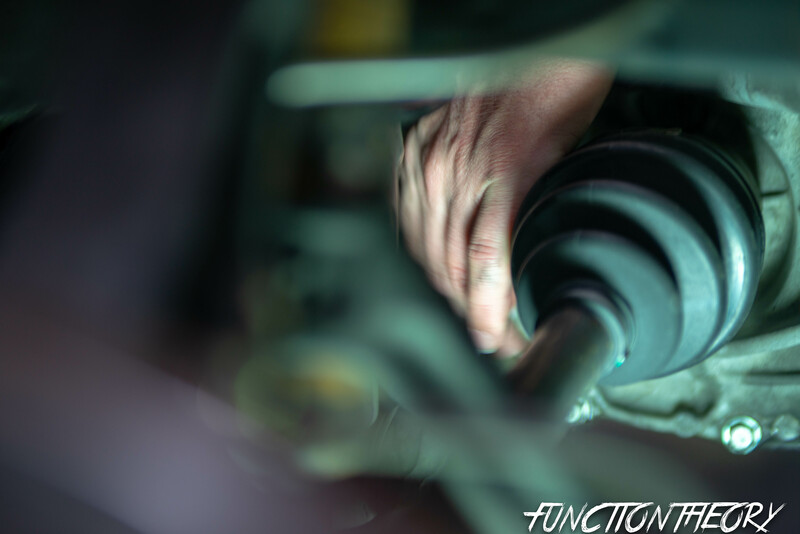 now do it all over again at least 40-50 times a day, how many times have your synchros had to help align the next gear ring as you slide the shift selector to the next gear. Now think about how many times those bearings in there spin around on a road trip of 400-500 miles, how much friction and heat builds up through out day to day use, not to mention spirited driving. Ok I’m sure you get where I am going with all this. Why would you neglect your transmission when the actual cost is nothing, and the labor is almost easier than an oil change. 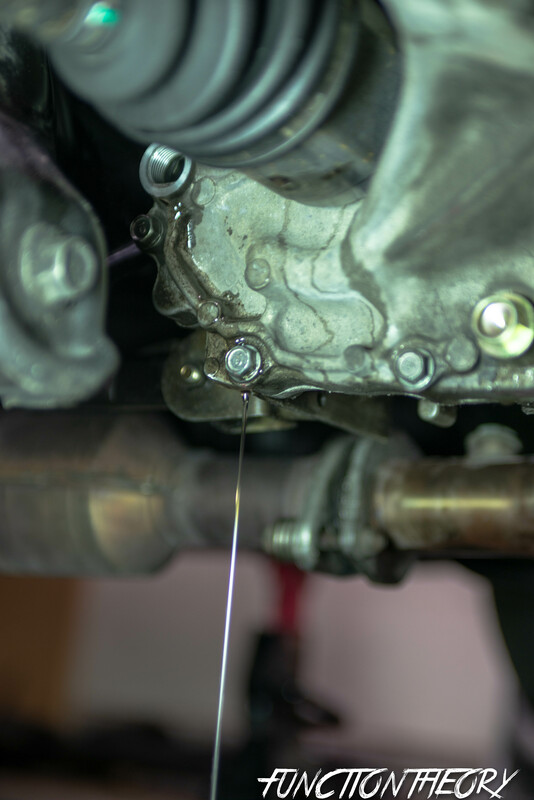 We all know that heat is the killer of transmission, heat cause the oil viscosity to break down and now the trans fluid will not lube the trans as well. 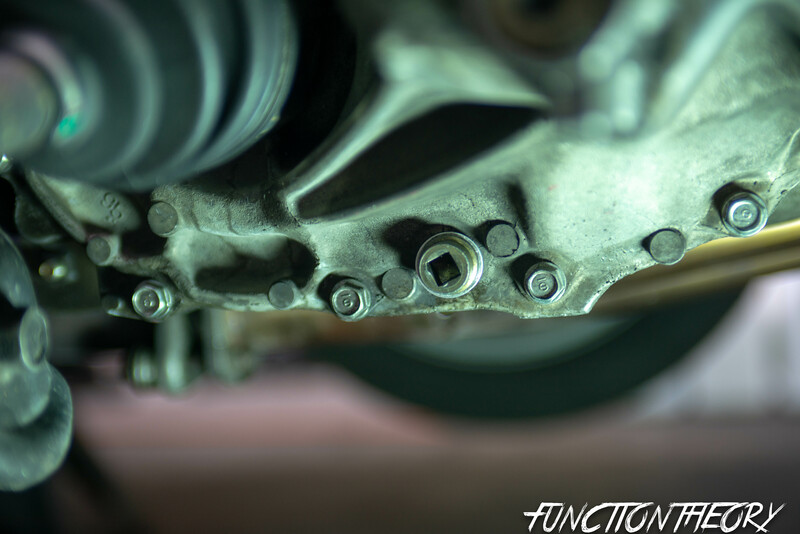 This will cause more heat and more friction, and cause premature wear on synchros and bearings. Now I know I’m being a bit pedantic, and I know that you know people that have had cars for 200k with out a single trans fluid change. It’s not that I’m saying modern transmissions won’t last long if you don’t change the fluid, but rather I’m trying to open your eyes to seeing the amount of wear and tear you can save. 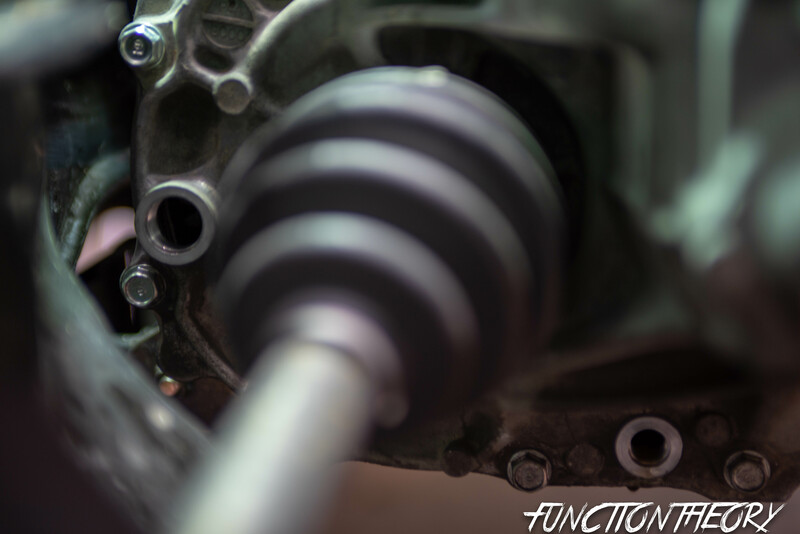 Or even prolong how good your transmission shifts by more frequently changing the fluid. Let’s break this down. Today I walked into Honda and bought 2 quarts of trans fluid costing 7.49 each. For a total of 16.29 you can change you trans fluid ( if you have a D series ) if you have a B,H,K series you will need 3 quarts ( actually between 2.5 and 2.8 quarts ) but still its pennies and will improve the life expectancy of you transmission. The work can literally be done in less than 30 mins, once you have done it a few times. there is no filter to change, and no gaskets to replace. You can replace your crush washers for the drain and fill bolts if you like. Honestly I don’t ever change them but for the sake of this write up I did. I am always saying that if you are going to expect 110% out of your car, then you owe it to your car to treat it well. 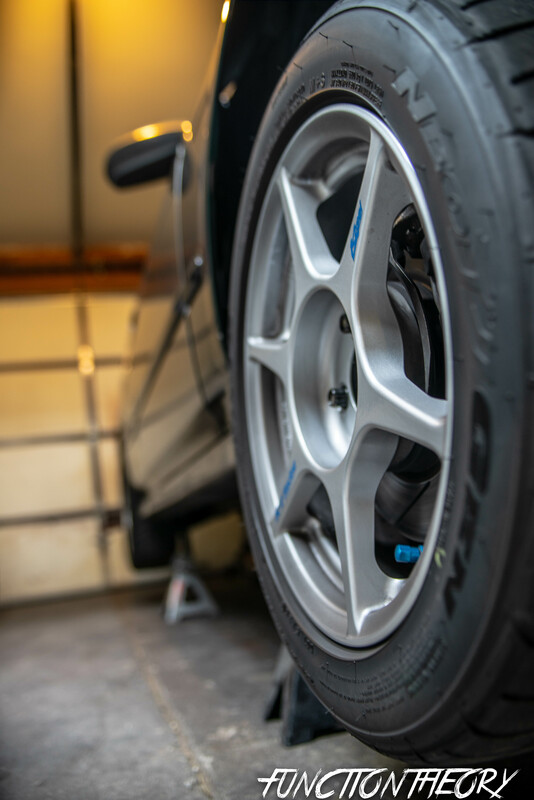 Proper maintenance in frequent intervals, and your car will treat you good by holding up to the abuse you put it through. 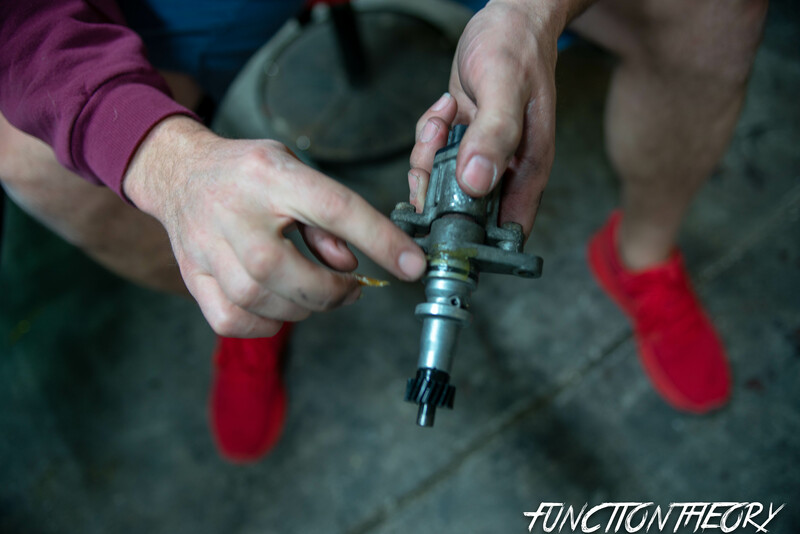 Hopefully i gave you some food for thought and maybe this how to below can help you start changing your trans fluid more frequently. On to the process. When looking up how too’s on the internet you can get very confused very quickly. Most people online have learned the incorrect way of doing something they have been taught by someone that they think knows how to do what they are doing. Now they are taking to the internet spreading misinformation and it’s infecting the world like a cancer of filthy poo spewing from the mouths of internet technicians that have no actual real world experience other than their uncle/cousin/friend told them that’s how to do it. 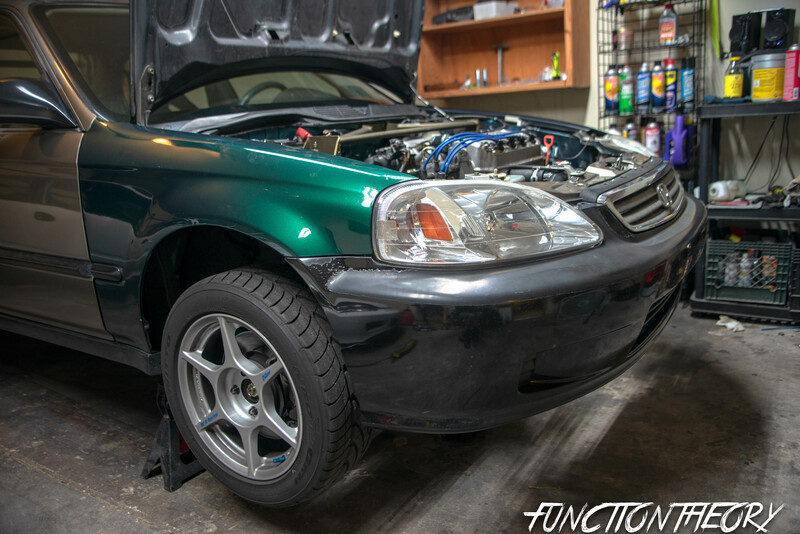 My how too is going to Explain how I have done it on umpteen million transmission since 1999.
jack the car up on four jack stands, making sure the car is sitting as level as possible. 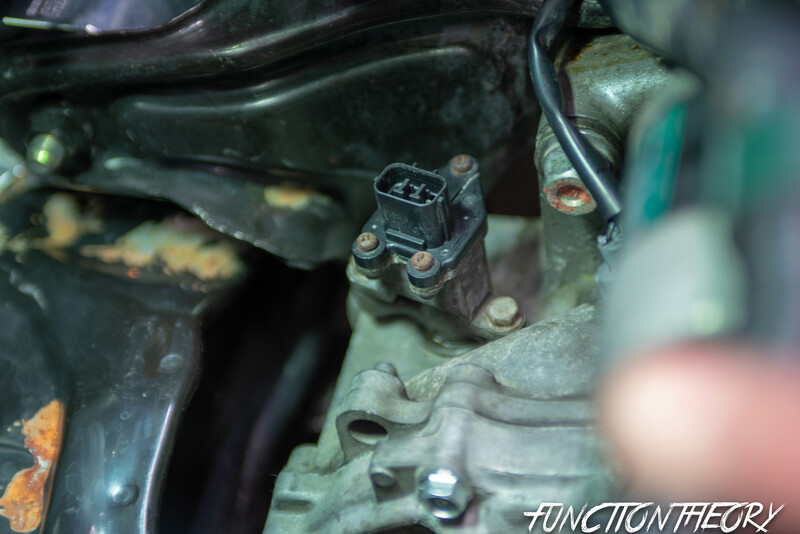 you will locate the speed sensor on the rear of the transmission. its towards the fire wall, near the rear T bracket mount right above where the shift linkage bolts to the transmission. 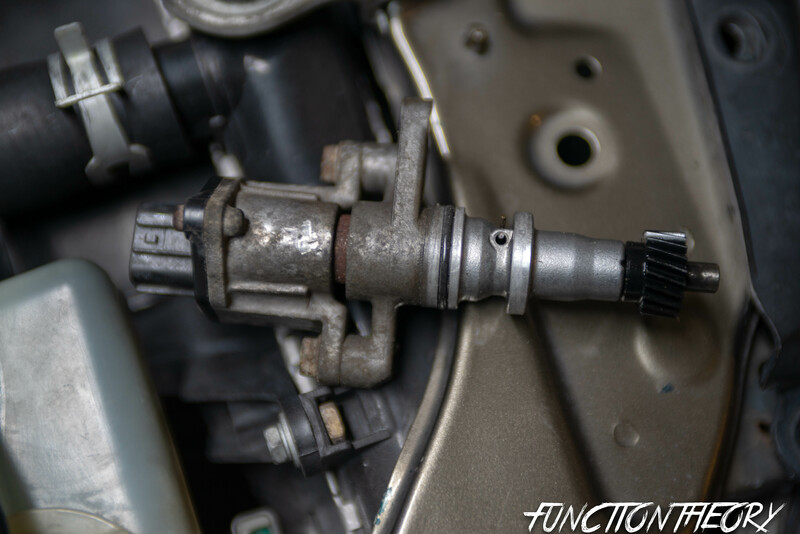 you will most likely have to remove the intake from the car to get down to the speed sensor. There will be a slight difference in speed sensors between OBD0, OBD1, and OBD2 but they will all look similar to this. 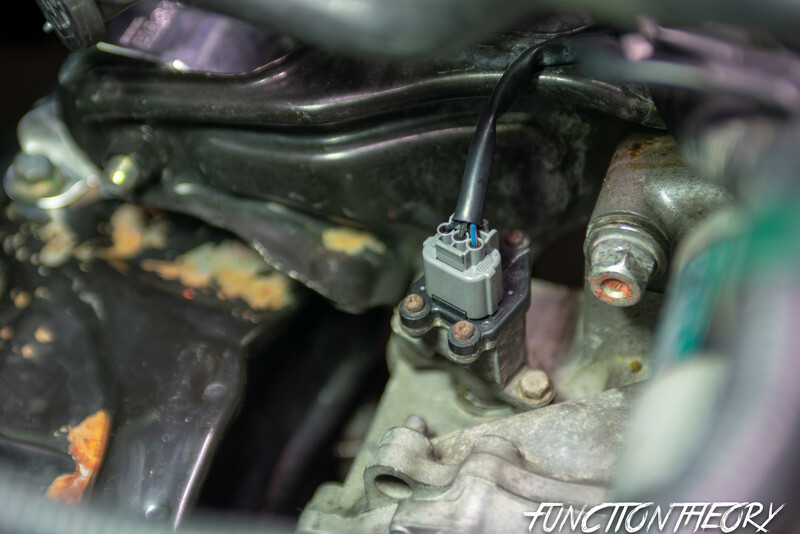 Also for OBD0 it will be a speed cable and there will be no electric connector. They will all be held in with ONE 10mm bolt, remove this bolt. Now you will be able to remove the speed sensor. slightly twist it clockwise, and counter clockwise, gently pulling up and it will come out. You can just tuck it out of the way and leave the connector plugged in. I just disconnected mine to show you what it looks like out of the car. 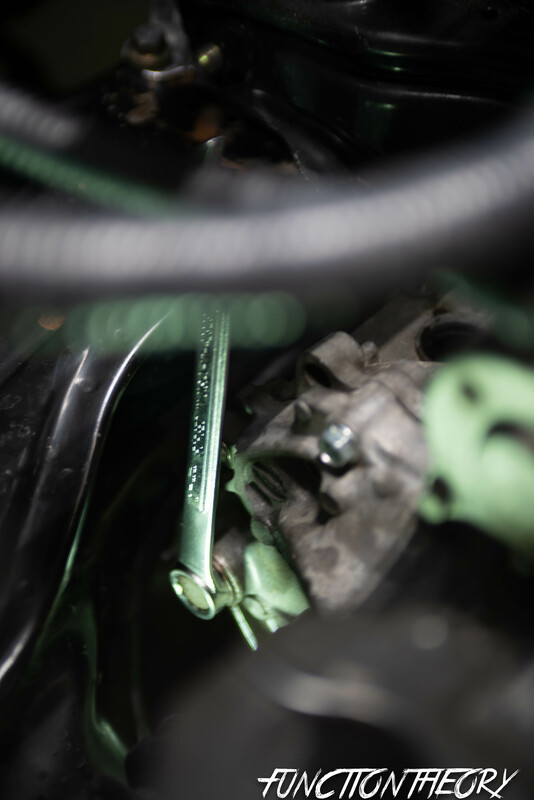 Now you will be left with a hole in the transmission, this will allow there to not be any vacuum when you take out the drain bolt so you can be sure all the fluid gets drained out. as you can see below this is the hole. ( DO NOT LET ANYTHING FALL IN THERE ) also you can see how i just left the connector plugged in and just moved the speed sensor out of the way. 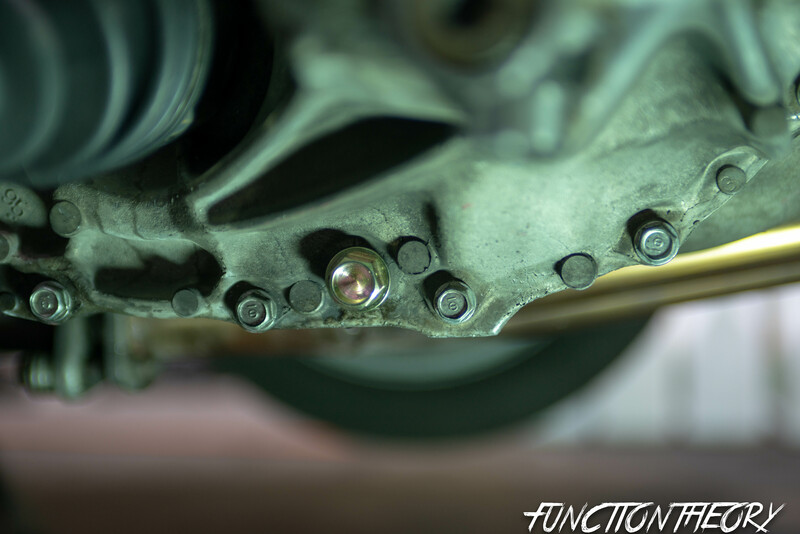 place an oil drain pan under the trans, and you are going to look for the bolt on the very bottom of the transmission that’s easily viewable looking from the passenger side of the car. 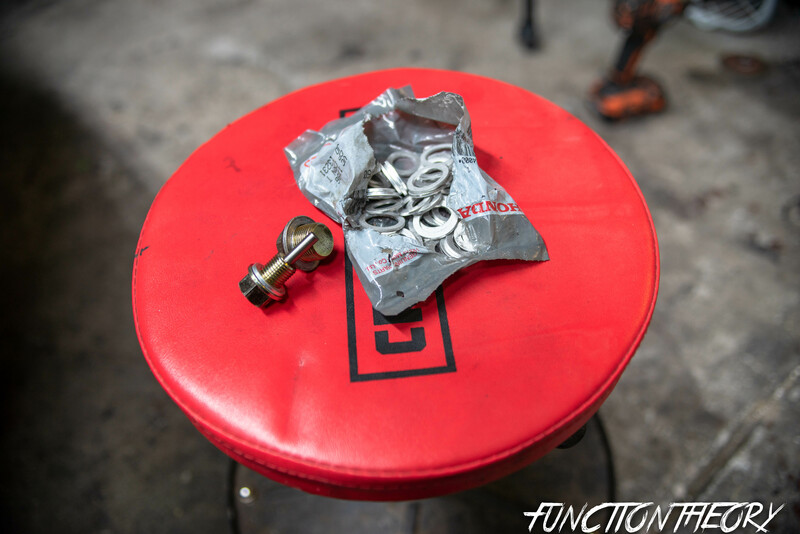 It is round bolt with a square hole that you will just directly connect a 3/8 drive ratchet to. there is no socket required. 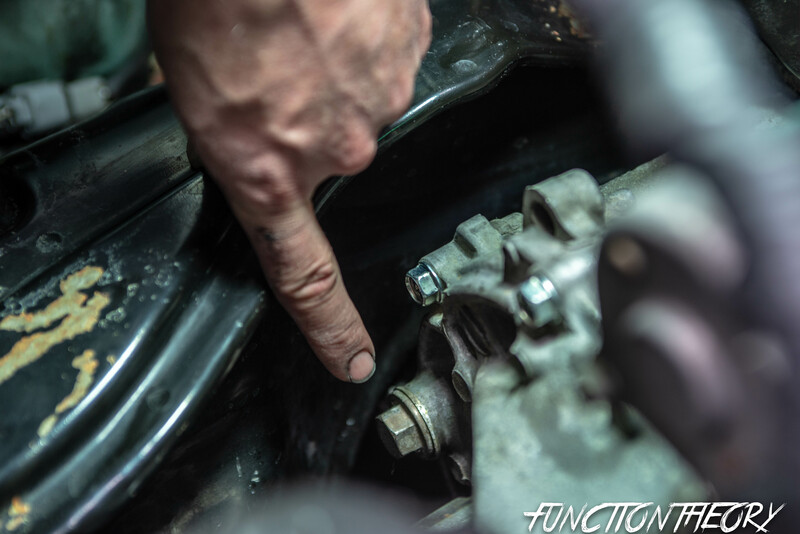 now connect the 3/8 ratchet into this bolt and turn counter clockwise to break lose, then remove the hand keeping slight pressure straight into the trans until you feel the last thread, then quickly pull the bolt away from the trans and have your oil drain pan lined up below to catch all the fluid as it drains out. 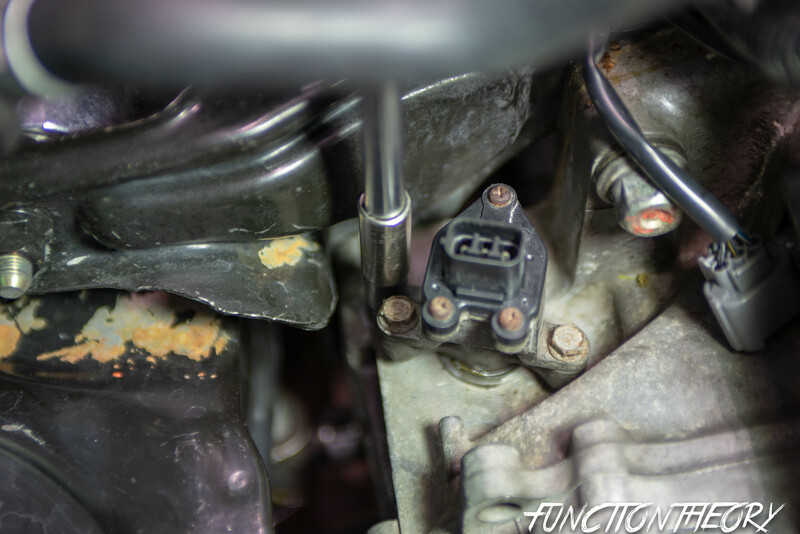 ONE QUICK NOTE… i am running spoon magnetic drain plugs on my engine and trans so my bolt looks a little different. it actually has a 17mm head. but this is the same location the 3/8 head bolt will be. the fluid will drain out. Here is what the magnet had gathered from my transmission. About 6 months since the last fluid change. Now granted my whole Y8 swap was 200 bucks and the millage is unknown so I’m not surprised by how much is on the magnet. When ever I do my K20 trans there isn’t much on the magnet. Either way the magnet is doing its job and keeping all those fragments from constantly swimming around in my trans fluid further more damaging or prematurely wearing it out. Now remove the 17mm bolt that is half way up on the rear of the trans just above the axle. SIDE NOTE, this is the bolt hole known as the fill hole. This is how most people refill the transmission. They would use a fluid pump to pump the trans fluid into this hole. I don’t do it that way, I feel its too messy and more laborious. 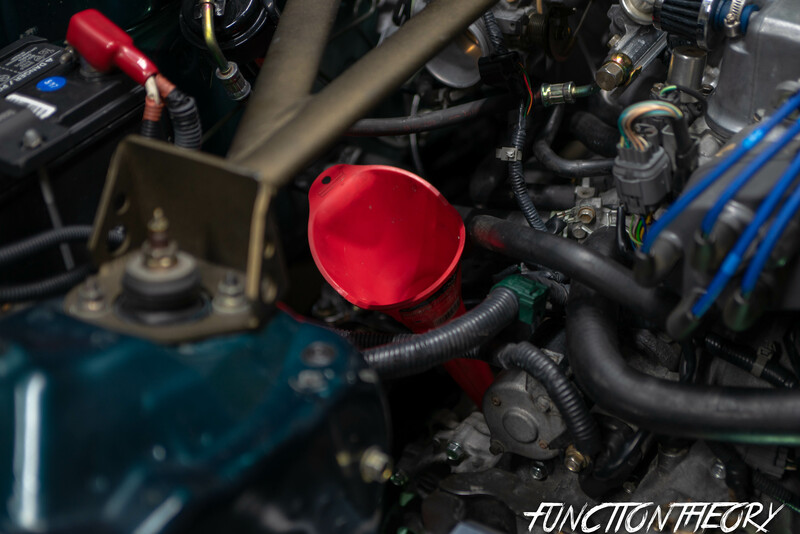 I simply remove the speed sensor and put a funnel in it to refill the transmission fluid, which is the other reason i remove the speed sensor. I still use this hole to know when there is the correct amount of fluid in the transmission. reinstall the drain bolt. mine is the 17mm head because I have the spoon magnetic one. But the stock one which most likely you have is the round one with the 3/8 head. The internet says 29 ft/lbs of torque. I usually just snug it just as tight as you would an oil drain plug. 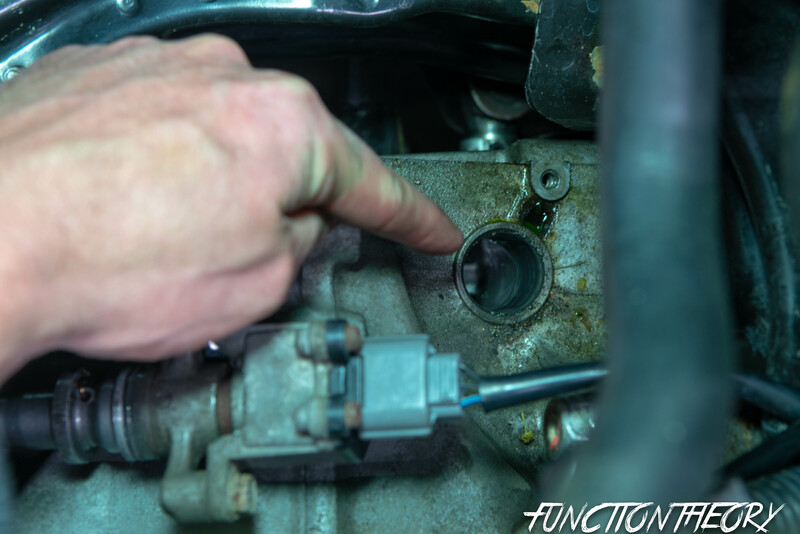 Put a funnel into the speed sensor hole, and fill the fluid. usually D series is 1.9 quarts. but I just pour the whole 2 quarts in and let the excess drain out of the fill plug hole. 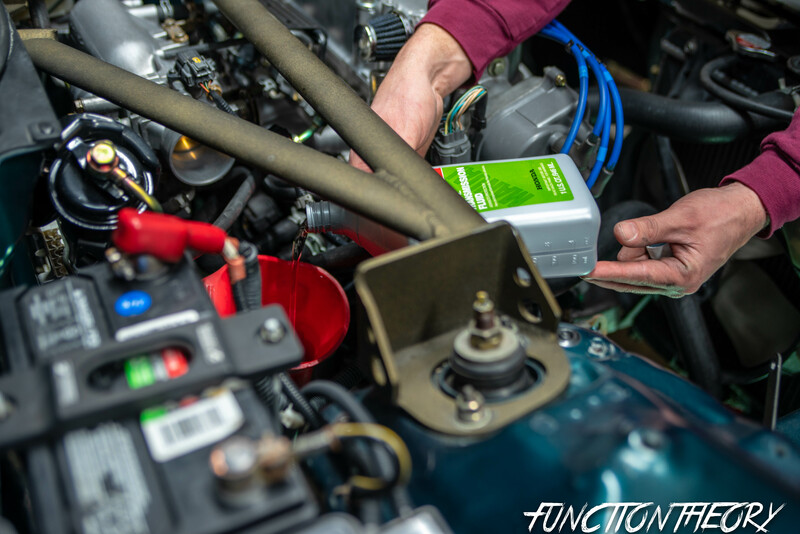 this will ensure the correct amount of fluid is in the transmission. SIDE NOTE. If the car is not level this will not be an accurate way of knowing if the correct amount is in the transmission. 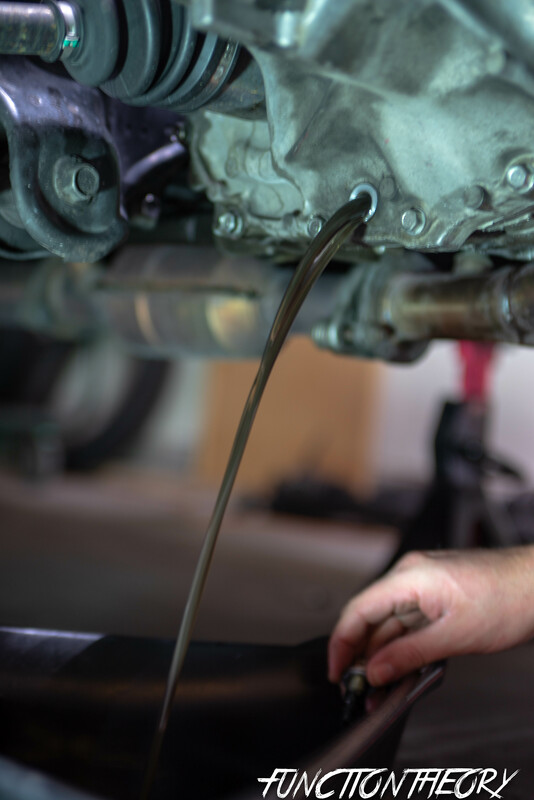 the Best way to do a trans fluid change is jack the car up at all four corners and make sure the car is completely level. as you can see the excess will run out of the fill hole. make sure you let it completely stop draining out. Then reinstall the fill plug bolt. The internet says 33 ft/lbs of torque, but i would just make it as tight as you did for the drain bolt. reinsert the speed sensor. I lube up the area where the rubber ring is to help the sensor twist back into place easier. 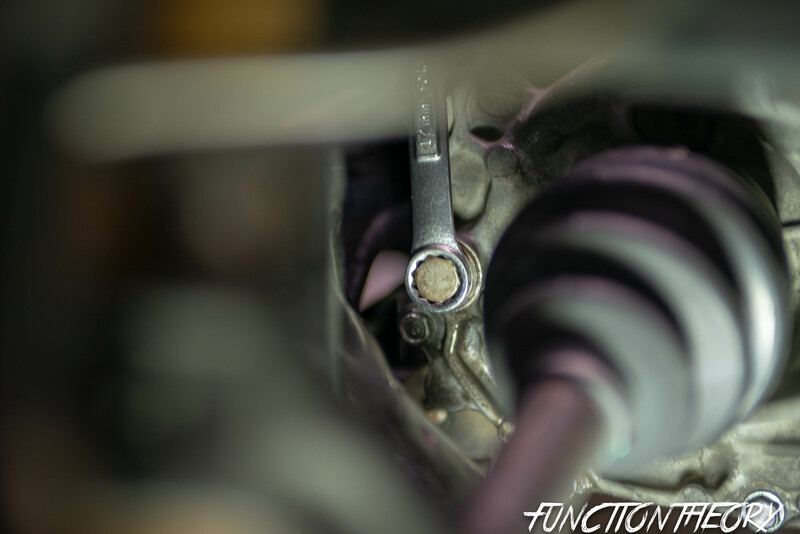 also on the above image take note of the tab that the one 10mm bolt goes through to hold the sensor to the transmission. (sticking out farthest on the right of the picture) Be very careful to make sure you have the sensor all the way seated down in the trans, if you don’t have it all the way seated ( twist counter clockwise and clockwise while slightly pressing down ) then when you go to tighten the 10mm bolt you will snap off the tab and thus will mean you need a new speed sensor. this bolt doesn’t need to be very tight, i would say no more than 10 ft/lbs I’m sure somewhere on the internet you can find the exact specs. reattach the electric connector ( if you actually disconnected it ) now you are all good. In conclusion you should have removed a speed sensor, a drain bolt, and a fill bolt. applied two new crush washers ( if you feel necessary.) reinstalled the drain bolt and added trans fluid. 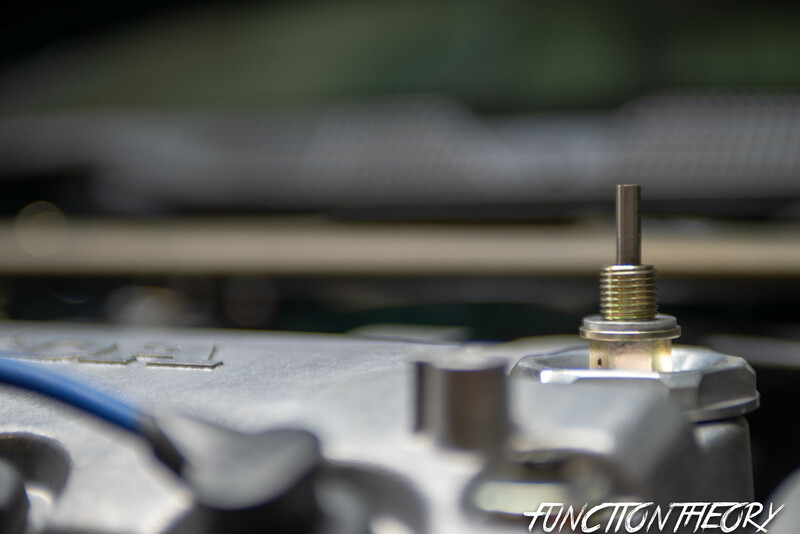 reinstalled the fill bolt once the fluid has finished coming out. Then reinstalled the speed sensor. I know it was a very long drawn out post. Its just very descriptive, the more you do it the easier you see it will be. But there is more! 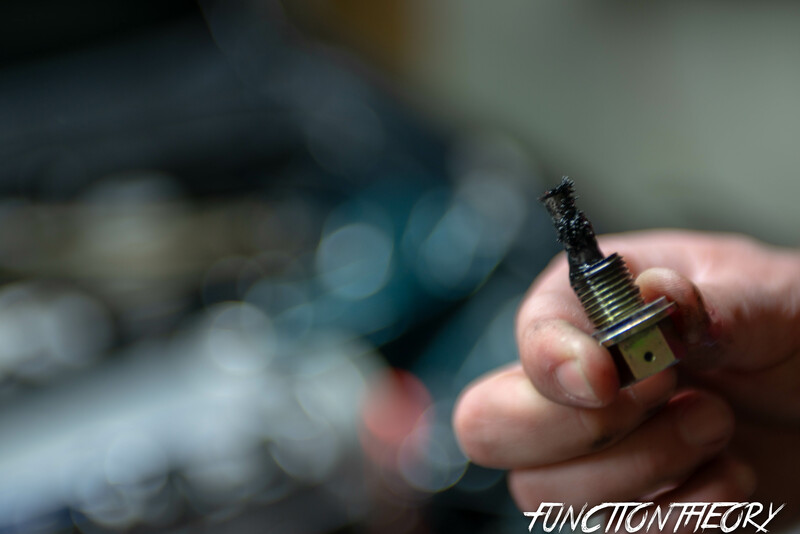 you didn’t think we could do a trans fluid change write up and not talk about the different type of trans fluid out there. 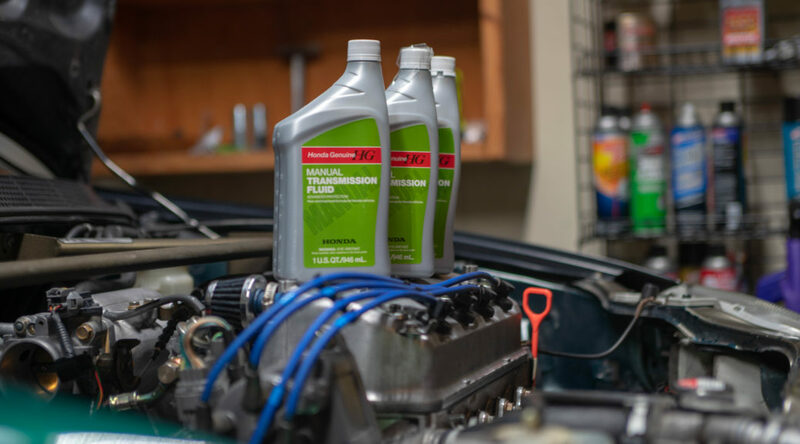 Some say Honda recommends just 5w30 motor oil, some say that you should use GM synchromesh or pennzoil synchromesh, other say royal purple, and some swear by OEM Honda MTF (manual transmission fluid). Yes there are many options out there. I have used them all, and feel that yes the synchromesh might make a used up older high millage transmission shift better at first. But I feel it is only a bandaid. I have also run just 5w30 motor oil it seems to work just fine. But when i switched to Honda MTF it was unbelievable how much smother the shifting was. 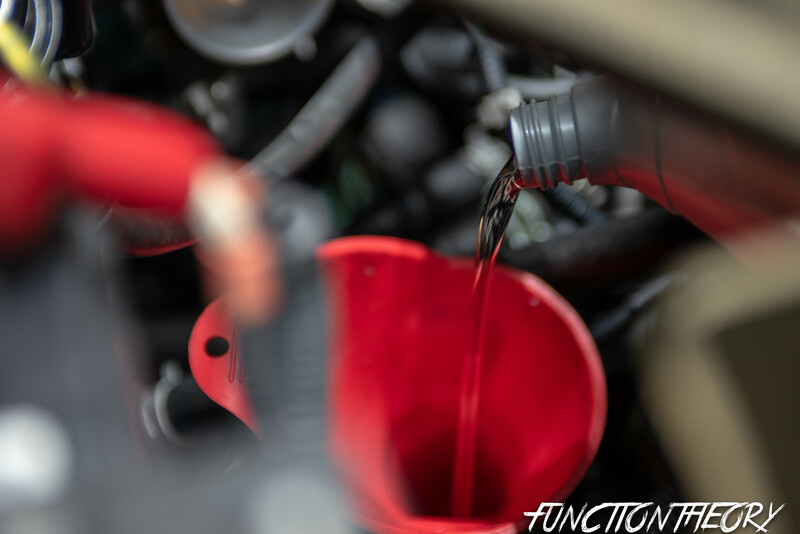 I try and only use OEM fluids and parts as much as possible, but on the other hand if you change your fluid frequently I don’t think it really matters what fluid you use. I will still stand by my Honda MTF though. Side note On my K20 I use the Kaaz Limited slip oil. 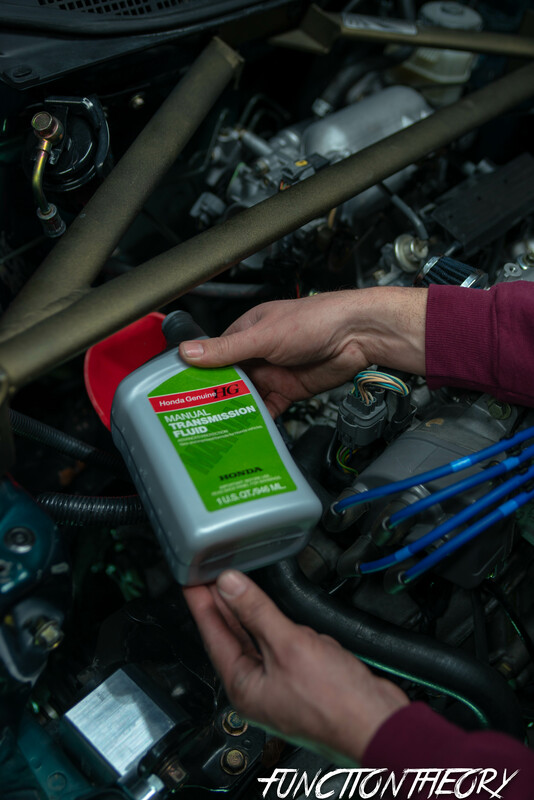 It is a much heavier weight oil and is better for my Aftermarket 2 way LSD I have in it. But on my brothers stock K20 I will use regular Honda MTF. Just remember to think of the many variables when people are praising certain fluids. Temp, humidity, driving style, race car or daily driver, new trans, old trans, freshly rebuilt, oil weights and viscosity’s, is their clutch new or worn out, are their motor mounts good or bad, etc. 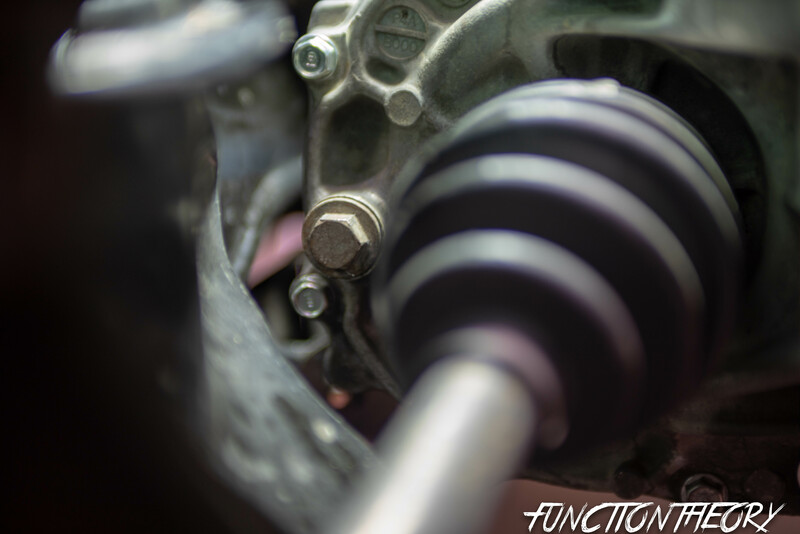 there is many different things that can impact the way a transmission will shift. 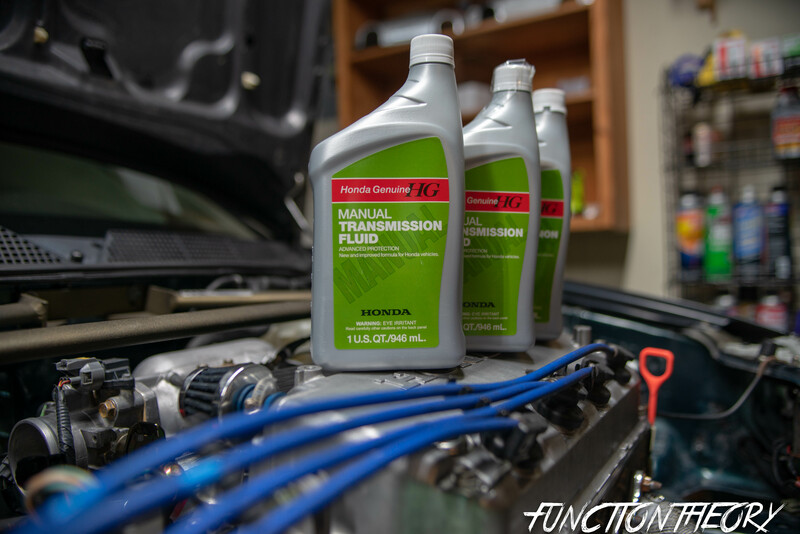 I recommend that you try different ones for yourself to see what the differences are and how your transmission will react differently to each different oil. As always please if you have any questions, comments, or concerns to this article or any others that are on here please feel free to comment, email me, or dm on instagram.